What am I going to do with you? How many times have we looked at our kids in the midst of a scene that you simply had to be there to even imagine, and asked this question to no one in particular? Too many times, I can honestly admit.Well, imagine this- in due time, our kids just might take a moment to look at us one day, wondering the answer to this exact, same question. Word to the wise, treat those kiddos well today to pay-it-forward for your tomorrows! That's right folks! No clowning around, you heard it here first- Grand-Daddy Day Care is now open for business. Thank you to the Grand-Daddy Day Care promotional team from Revolution Studios and Universal Pictures Home Entertainment for the courtesy of providing promotional media review product and materials for editorial content purposes. This post may contain affiliate links. So here's how it all begins... Hubby and dad, Frank is struggling to complete his current writing project when inspiration strikes. Deciding to find a unique niche in the market, and cashing in on his stroke of genius, he opens Grand-Daddy Day Care for his father-in-law (Danny Trejo) and a round-up of a few of the other neighborhood seniors to keep their household afloat while he continue to work on writing his next book. Easy money! Nope! Of course, not. Who would ever imagine that spending time feeding, caring for, and entertaining our parents (or our kids) would happen as simply as planned? This all-star cast of familiar faces bring on the antics as the older and wiser group comes together as a team. Frank discovers his hands are full doing everything but taking care of business at Grand-Daddy Day Care is a hilarious story full of comedy fun for all to enjoy. Showcasing an top-tier ensemble cast, Grand-Daddy Day Care features Danny Trejo (Machete, Dead Again in Tombstone) and Reno Wilson (Transformers franchise, “Good Girls”) along with supporting cast members Barry Bostwick (“Inside the Extras Studio,” The Rocky Horror Picture Show), Linda Gray (“Hilton Head Island,” “Hand of God”), Julia Duffy (“The Cool Kids,” “American Housewife”), Alec Mapa (You Don’t Mess with the Zohan, Marley & Me), Garrett Morris, Margaret Avery (“Being Mary Jane,” Proud Mary), Roxana Ortega (“The Loud House,” “The Santa Clarita Diet”), (Coneheads, “Saturday Night Live”) and George Wendt (“Cheers,” “Modern Men”). 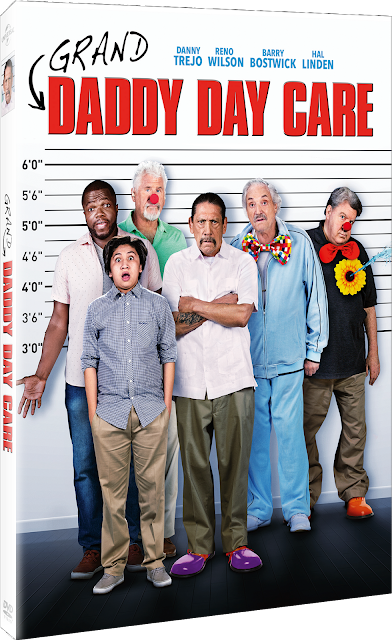 Take a time-out for the whole family to enjoy Grand-Daddy Day Care, open for business on DVD, Digital, and On Demand.